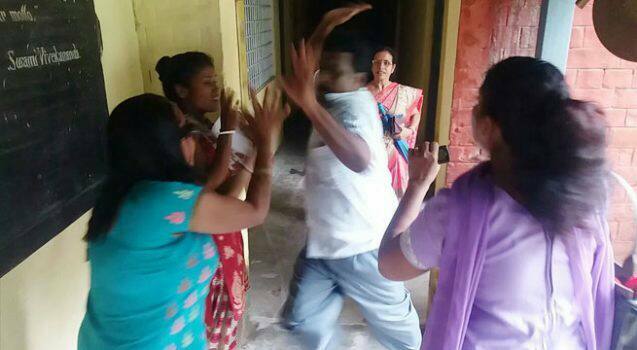 Chaos broke out at a school in Siliguri after a head master was accused of molesting a class 3 student on Thursday. The incident is of Siliguri New Jalpaiguri Railway Girls’ High School. The parents staged a protest against the head master when the head master is reportedly seen manhandling a student’s mother. He is seen grabbing and pulling the woman by her hair. The accused head master is Chottu Hansda. The mother of the victim accused the head master of molesting her kid for a long period. As per the mother, her child became very scared after the incident. She even refused to go to school. When she tried to protest today, the head master allegedly attacked her in return. Seeing this, the other parents started beating up the head master and finally locked him up in a room. The officers of the NJP police station rescued and arrested the head master. But Chottu Hansda has said that the allegation of molestation against him is completely untrue. He said that he had just beaten the girl if she failed to answer questions related to her course of study. On questioning about his assault on the child’s mother, he said that the parents assaulted him.